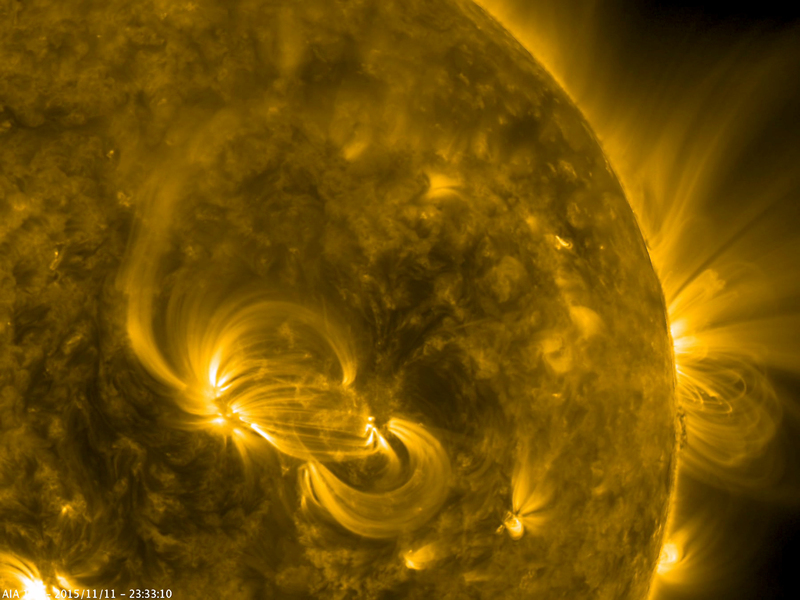 November 18, 2015 – Two active regions sprouted arches of bundled magnetic loops above the sun’s surface in this video from NASA’s Solar Dynamics Observatory (SDO) taken on November 11-12, 2015. Charged particles spin along the magnetic field, tracing out bright lines as they emit light in extreme ultraviolet wavelengths. About halfway through the video, a small eruption from the active region near the center causes the coils to rise up and become brighter as the region re-organizes its magnetic field. This video was taken in extreme ultraviolet wavelengths of 171 angstroms, typically invisible to our eyes but colored here in gold.